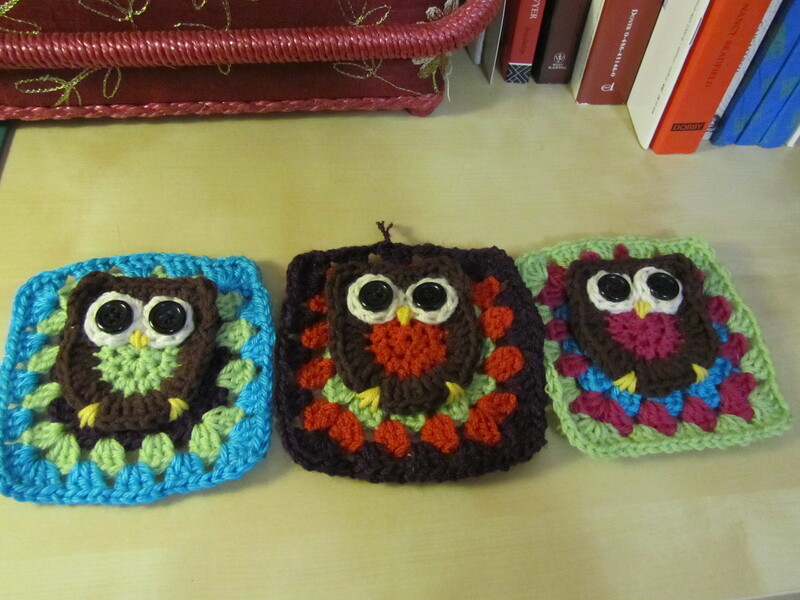 I’ve done 3 of my planned 5 crochet owls. They’re so cute! 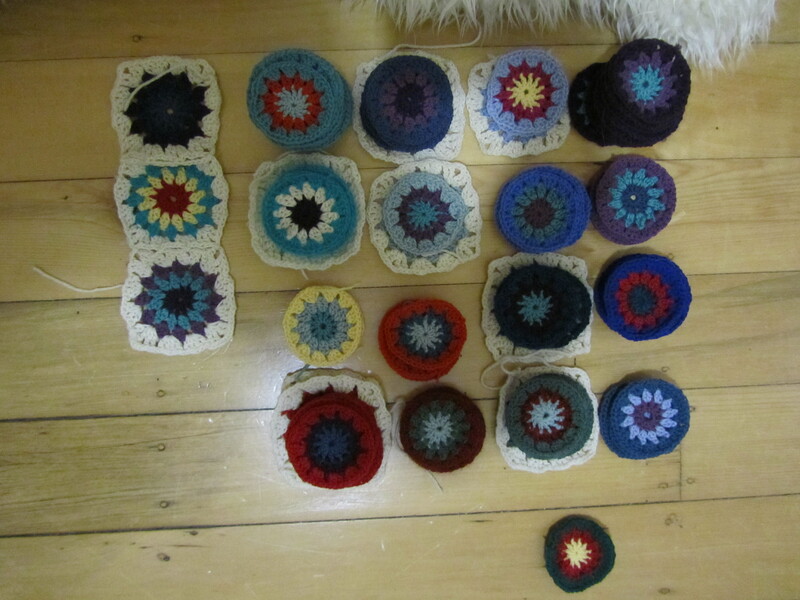 A saw a picture of one of these lovely ‘circle in a square’ afghans on Pinterest, and then I found this pattern, which is what I’ve been using. When I get enthused I can get quite a lot done pretty quickly but I keep getting distracted and putting it away for months at a time. Getting tendinitis didn’t help either. 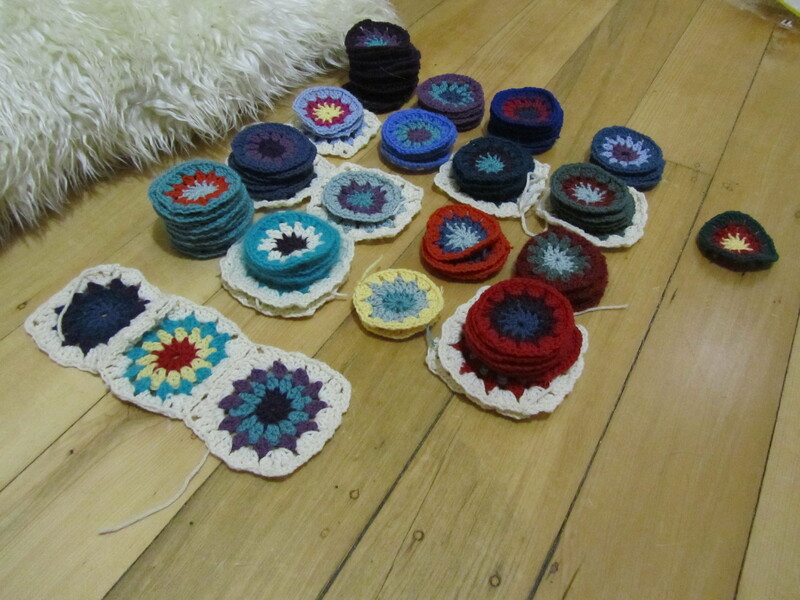 At the moment I have 90 circles, so I’m somewhere between a half and two thirds done, depending on how giant I make it. 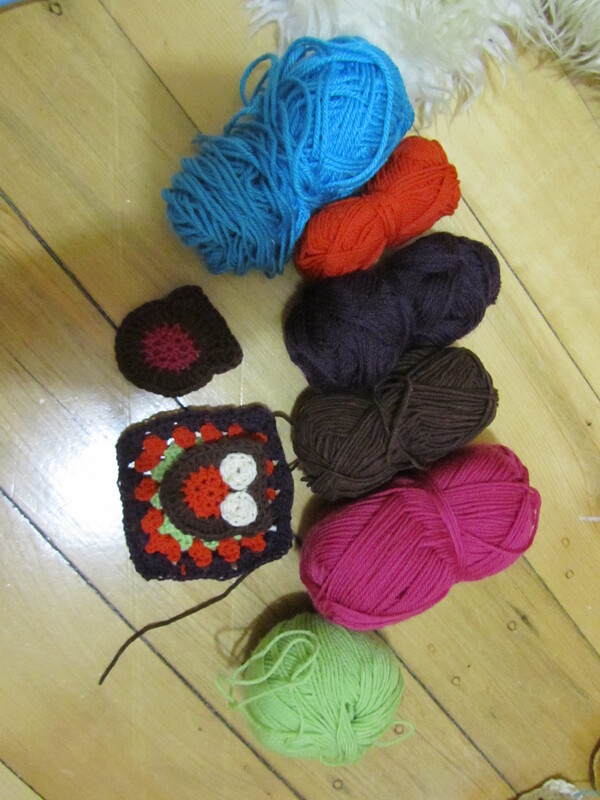 I’m a bit worried I won’t have enough cream wool to make it enormous though. Oh, and when I started I was putting the cream borders around until I realised that it would be easier to link them up if I do all the cream at once. Then I did a few more cream bits to make sure I would be able to put them together, but I can and I think it’ll look nice! My grandmother was very impressed that I won’t have to sew lots and lots of squares together. They are so cute and I couldn’t resist them. I won’t do a whole afghan of them, and I don’t want to mix them in with my dignified, classy looking one, so I think I’ll just do a cushion cover. 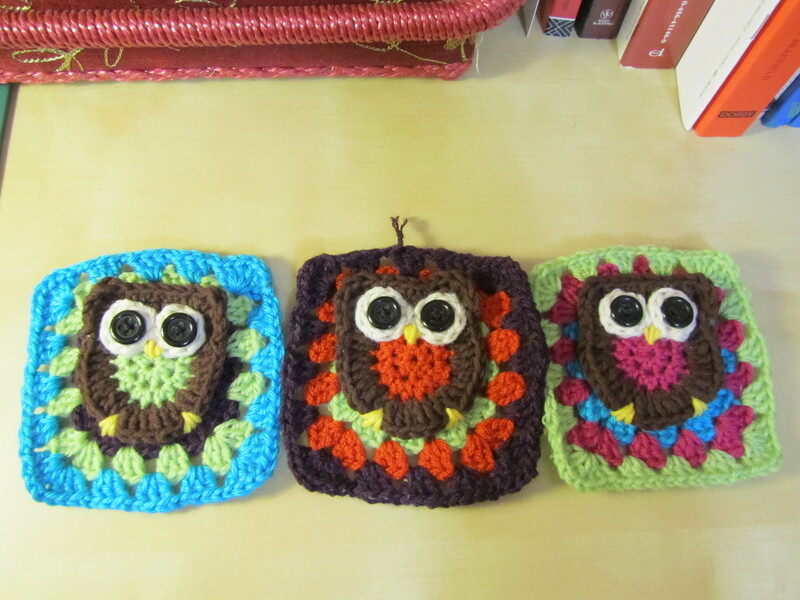 And I in fact have three owls now, so it shouldn’t take long, except that I was thinking of doing the back in cream, so I really need to wait and see if I actually have some left over from the afghan… Or buy more, if I can. Oh, the colours I’m using for these ones are mostly a selection taken from the afghan ones (the pink and green are new so I haven’t made any circles from them yet, but they’ll be in there) except for the bright, shiny, acrylic blue. I kind of have in mind a cute fabric range that I’d like to make cushion from which has similar colours. Fitting: a few months ago I asked a friend who was briefly in Canberra to check the fit of my prototype. She suggested cutting the tab slits higher, bringing the front shoulder tabs in and altering the angle of the lacing at the back. I made all these changes to the prototype (had to cut yet more pieces for the front, grumble) and I think it went well, although the lacing at the back met, so it’s possible that the angle still isn’t ideal. On the final version I’m taking an inch off each piece so there will be a gap, so I’ll have to see how it goes. Oh, and I added some curve to the side-front seam of the piece since I’ve read (for example, from American Duchess) that this is how you get the more rounded line of the later decades, which sounds more flattering and more comfortable to me. Materials: I’ve had a lot of trouble deciding on materials, but I’ve finally made some decisions. Ideally, I wanted to make the stays soft blue with pink trimming. I have some blue silk, but it’s actually quite yellow-y and odd, so it really doesn’t go with pink. Then I ordered some pink silk twill ribbon from etsy for binding, but when it arrived the colour turned out to be less rose pink and more salmon, so it needs a nice clear colour so that it doesn’t just look brown. I was going through my silk collection and realised I have just enough ivory silk dupion left over from binding the last set of stays and it looks OK with the silk ribbon. I also managed to find some pink silk thread that goes well enough, so it looks like the stays will be ivory with pink stitching and bound with ribbon. For the interlining fabrics, I’m using a layer of beige-y cotton/linen and yellow cotton canvas. Finding pure linen fabrics without stretch was basically impossible, and I think the final effect will be the same. Also, I’m hoping that only having one layer of canvas will make the stays more forgiving and curvy than the last set, which had 2. If I put in a lining, I’ll do it at the end. I have some reasonably soft pale blue linen that I can use. Boning: I’ve still got German synthetic whalebone from the last stays so hopefully there will be enough. In terms of arranging the boning, I think I’ll look at these stays from the V&A, this pattern from JP Ryan, these amazing stays, and the Butterick pattern I’ve been using. 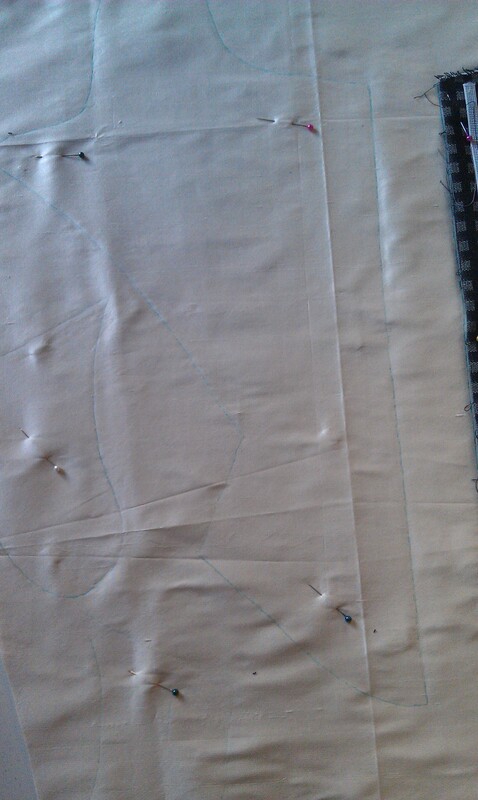 I’m starting with bones along the seam lines. Cutting out: I’ve traced the outline (without seam allowance) of each piece onto the silk and then cut out them out of all layers, leaving plenty of spare fabric all around the lines. Then I basted around the outline through all three layers. Construction: I’ve started sewing the boning channels. I’m sewing by hand, using backstitch. I’m not sure how that’ll go, it’s much slower than machine, but it does give me more control – doing channels by machine, I often had to undo them if it got wonky, or I realised that it was slightly too tight for the bone – by hand I can check these things as I’m going, instead of unpicking the whole thing and starting again! It also means that I can do a seam or two at a time, watching tv or while I’m at uni. Then once I’ve done the channels, I’m planning on whipping the edges of the pieces together. Anyway! Progress. I think it’s going well. Anyway, I need to try it on again, but I need some spare time when I’m just going to be a home for a few hours! That hasn’t really happened recently. And then I need to make final decisions about fabrics, boning etc. Blah. I’m going to construct it in a more sensible (and hopefully accurate) way so that if I hate it when it’s done I have more chance of fixing it. whether to raise the neckline (I think I probably should, I can always cut it down later). I haven’t added any length so far because I was a bit daunted by how to do it, but I think the neckline is where it’s needed. whether to take it in more at the centre front. At the moment the armscyes are digging in and the lacing gap at the back is too narrow at the top, so hopefully taking it in more would help. Basically this adds up to cutting a new front piece. Sigh. Off I go. The 1780s sewing weekend was lovely, even though I only managed to make it for one day (grr to having to earn money) and it was great to spend time with lovely people and share ideas. However, it seems as though I may actually be further behind now that I thought I was at the beginning of the weekend. Sigh. I spent pretty much all of my Friday working on my eyelets, finishing them at about midnight. I decided to be good and pierce the holes with an awl (which worked, for once) and whip-stitch around them with silk thread. It wasn’t difficult, it just seemed to take forever. And in the end the holes were a tiny bit tight for the aglets on my lace, so lacing them up was a bit more of a chore than usual. I also made a bumroll from a pattern Aylwen had drafted up. And then on Saturday the problems began. I tried the stays on for fitting the bodice toile, and I discovered they were way less comfortable than I thought they would be (despite my careful re-sizing and testing at earlier stages of the process). Then the bodice was about 2 inches too short, and sadly the Portrait Dress pattern does not include a helpful shortening/lengthening line so adjusting it across odd slopes was going to be a bit of a pain. In the end I decided to give the JP Ryan Robe à l’Anglaise pattern a go as it did have lengthening lines so adjusting it would be a bit easier. 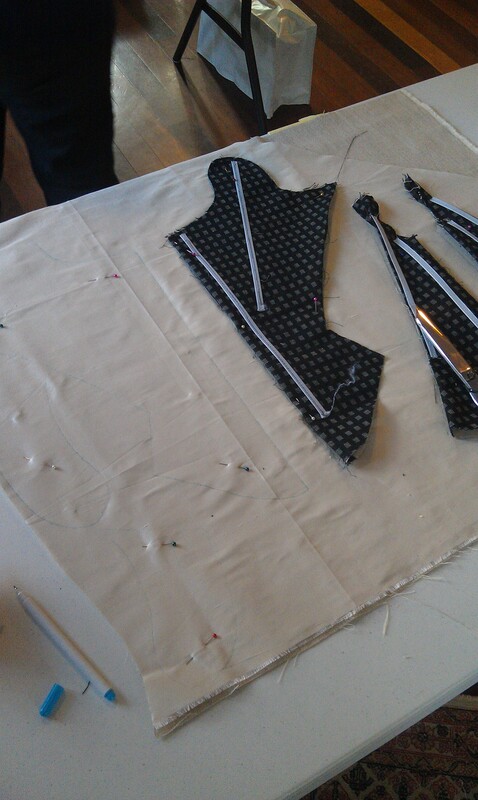 So I wasted some time tracing a new pattern and cutting out a new toile (with 2 inches added to the waist). The new toile turned out quite a bit better. I can probably take a bit of the length out (as I’d hoped) and I had lots of help fitting the toile to me, cutting the armscyes deeper and adjusting the angle of the shoulder straps (the extra piece made this pretty easy). We also spent some time debating what to do about the point at the back of the bodice – originally we were going to flare it so that it came out neatly over the bumroll, but after looking at some pictures we decided that the angle was too sharp and the bodice should curve out more gradually, without flaring. We then had some questions about what was making the angle of the bumroll too sharp – was it too firm, tied too high, or the wrong shape? After some research of my own, I’ve decided it looks like the right shape, but I should take some stuffing out and tie it a little lower. Over the day I took my stays on and off quite a few times… And by the end of the day I was actually starting to have some sympathy for Elizabeth Swann. Later in the afternoon, I actually did feel lightheaded and thought I might faint (apparently I turned white). Added to this, I’m not that happy with the look they achieve – according to Lynne, who is much more experienced in fitting such things, I should have cut the points at the front higher and flared the centre front piece towards the top for a better shape. I tried making a small pad to put in the front to try to take some of the pressure off my ribs, and it helped but didn’t fix the issues. 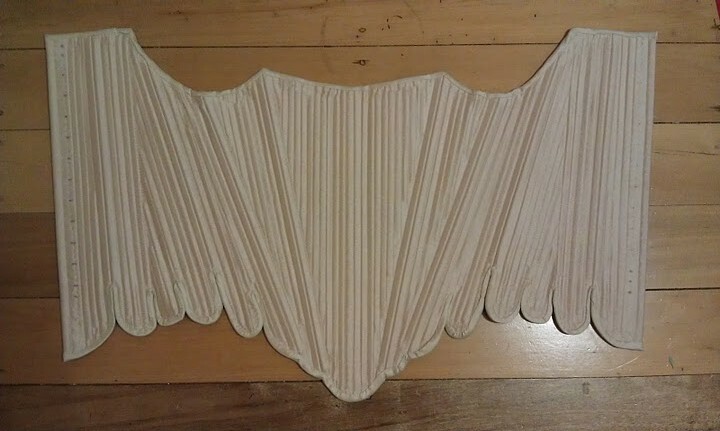 Anyway, the stays issue is a post in itself, but it did make me decide that I really need to make sure I’m happy with the stays situation before I finalise my bodice adjustments. Gah! Well, my C18th outfits are slowly progressing but I’ve hit a bit of a rut and really haven’t done much. I’ve done my research, chosen my design and bought all the fabrics I need, so I’ve run out of fun things to do and have to trudge through the boring slow bits before I can get to the more interesting work of actually sewing the dress. 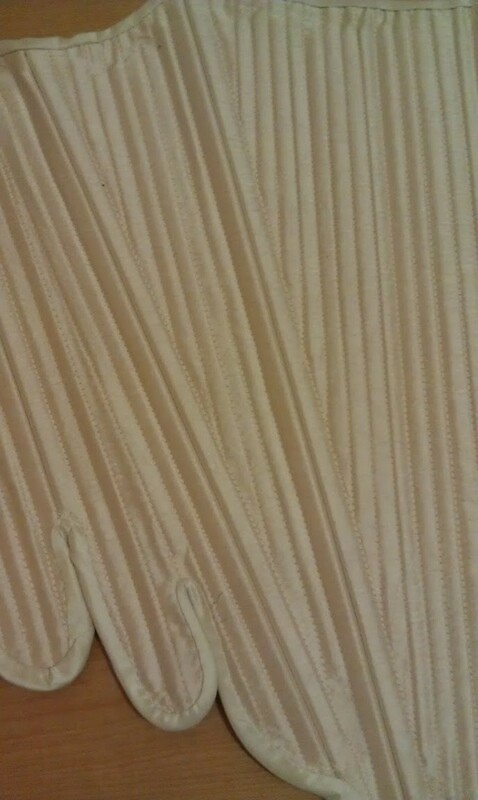 The corset is all done except for the lacing holes. I’m still trying to work out how to do them – the internet seems adamant that I should use an awl to pierce the hole rather than cutting them but when I’ve tried this in the past it just hasn’t worked at all. Maybe because I like to use closely-woven silk taffeta? Anyway, I guess I’ll have another go. I also need to make a bumroll, probably before I get into doing proper toiles and fittings. Drafting one up and making it from some calico and stuffing shouldn’t be hard, it’s just another boring, fiddly thing to do. I’ve already traced a proper pattern for the bodice from my epattern and cut and sewed a calico toile, but I can’t really progress until I’ve got working stays and a bumroll. Sigh. You are currently browsing the archives for the In Progress category.